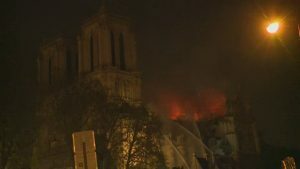 PARIS, France – Firefighters continued battling a catastrophic fire at Paris’ Notre Dame Cathedral as night fell across the French capital. Earlier, the fire caused the collapse of the cathedral’s spire and spread to one of its landmark rectangular towers. The cause of the fire isn’t known, but the Paris prosecutors’ office ruled out arson and possible terror-related motives.